Under the summer sun, something’s begun, taking over those summer nights. The 1978 movie and musical hit Grease is taking stage as part of the Summer Arts Intensive in West Fargo. In 2010, Adam Pankow started the program to bring arts to students during the summer months. The program is open to students in middle school, high school and college. Last month, the middle school program performed Willy Wonka Jr., with the high school students as mentors. This month, the high school and college students are performing together as part of the program. In total, 35 students are performing in Grease. All, Pankow stated, are from different backgrounds, schools and training programs. Rehearsals started July 5, starting what Pankow calls the “intensive” part of the program. Rehearsals are four days a week, for seven hours. Pankow said Grease was chosen for its ability to support a small cast, that allows for individual learning. “With a smaller performance, there’s an emphasis on the ensemble,” Pankow explained. “Grease is such a great show for that. 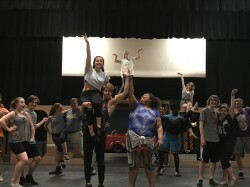 We can showcase a ton of people.” Grease isn’t unfamiliar to the stage, having its stage adaptation interpreted by multiple theater companies. But Pankow assures that this performance will hold its own unique spin.